The guy is under the microscope of Congress, Mueller’s people, US Attorney’s in New York, Maryland and Wash DC , in addition to New York and other state Attorney Generals…. 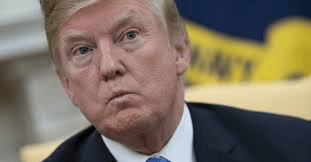 To think that there isn’t gonna be some collateral damage to Donald Trump himself is beyond reality…..
Donald Trump IS losing the battle to keep himself and his action out of the public’s eyes…. Being President just precludes THAT…. Despite the view that he’d change idea that President MUST reveal every thing about their lives…. Everything IS getting dragged into the open…. In addition to the probe into allegations of Russian collusion led by special counsel Robert Mueller, Trump faces separate inquiries encompassing matters such as the financing of his 2017 inauguration and payments to women in the run-up to the 2016 election. House Intelligence Committee Chairman Adam Schiff (D-Calif.) last week announced new parameters in his panel’s investigation of Trump, including examining whether any “foreign actor…has sought to compromise or holds leverage” over the president. “There is no question in my mind that Trump feels like the walls are closing in and he is increasingly losing control over his own destiny,” said Michael Avenatti, the attorney for Stormy Daniels. “His statements reflect that fact.”….